Orientation four years ago was a blur of new experiences and an overload of new information. While I remember sitting in Thorne for lectures, I remember very little of the content four years later. But among it all, one thing stood out: being introduced to the use of the term “y’all.” The ASOC president, giving a speech to the incoming class, opened with: “Hi y’all!” Throughout his short speech, he repeatedly referred to the audience as “y’all.” The content of his speech is now lost to me, but I can still hear those opening words. But now, it’s rare to hear someone using “y’all” to refer to a mixed-gender group. My professors in particular seem to have reverted to using “you guys” nearly exclusively when referring to students. My classmates and friends are also less careful about it these days. 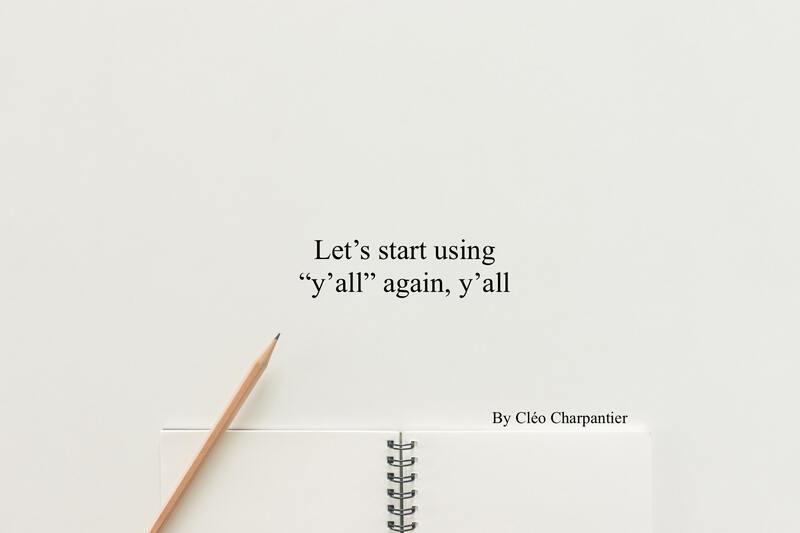 I still intentionally use “y’all,” but sometimes get a funny look when doing so. And I catch myself slipping up too. The way we use our language is important. It shapes the way we think, act, behave. It shapes our culture. We have fallen out of the habit of gender-neutral language and back into the habit of using “guys” to refer to mixed-gender groups. At a cultural moment when discourse about sexism is so salient, we ought to be more careful about the gendered meaning of our words. Gender-neutral language is important because it does not assume the neutral to be male, as has been the standard forever. And let’s not forget that there are many other gender-neutral ways to refer to a group of people that might not have such a strong Southern note as “y’all.” “Everyone, people, you all, folk, friends, pals, gang, tigers, fools and weirdos” are all great gender-neutral words that can be applied to any group. When talking to or about a group of women (when sure about their gender identity) “gals, women, ladies, cowgirls, etc.” work too. But “you guys” is not neutral. It does not overlook gender, as some who defend the expression might say. Linguist Sarah Lawson even goes so far as to call the expression “lexically meaningless, because it does not particularize ‘you,’” but I disagree. “Guys” is explicitly gendered: it assumes the neutral, or the standard, is male. Sociology professor Sherryl Kleinman, in her influential paper on the topic called “Why Sexist Language Matters,” makes the point clearly: Language that takes male terms as neutral is “another indicator — and, more importantly, a reinforcer — of a system in which ‘man’ in the abstract and men in the flesh are privileged over women.” This kind of language, which includes not just “you guys” but words like “freshman” and “underclassmen,” maintain a sexist system that is falling out of place. “You guys” excludes women and other non-male members of the group in question. And it’s just lazy and boring. Language is shaped by common usage. “You guys” was introduced into common speech by sustained shifts in usage, and by an acceptance of the term as supposedly gender-neutral. For “you guys” to fall out of use and be replaced by “y’all” will take sustained and collective shifts in use. We all have a responsibility to be careful about how we speak and what we say, because it means something. 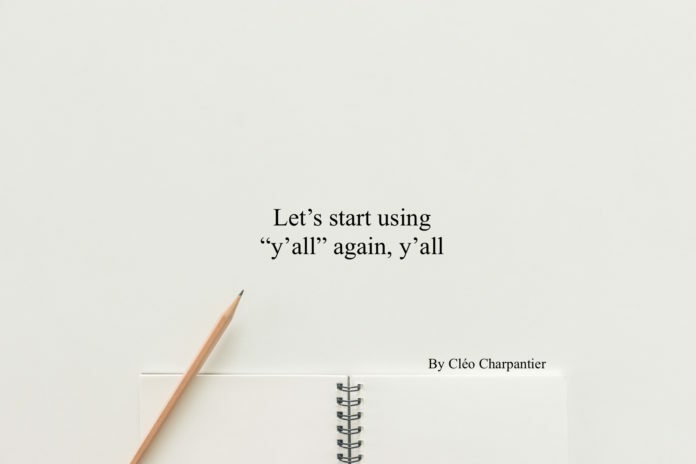 Let’s start using “y’all” again, y’all. Cléo Charpantier is a senior philosophy major. She can be reached at ccharpantier@oxy.edu.